is our delicious organic raw honey combined with Goji Berries. Our Raw Goji Honey can be used as a tonic food in place of plain honey or added to your favorite food or beverage that you already use raw honey in. Raw honey happens to be the only sweetener mentioned in the entire Bible making it the original sweetener. When the Israelites were looking for their promised land it was a land flowing with milk and honey! Goji Berries have been used in Traditional Chinese Medicine for thousands of years. They have a sweet flavor and a neutral thermal nature. 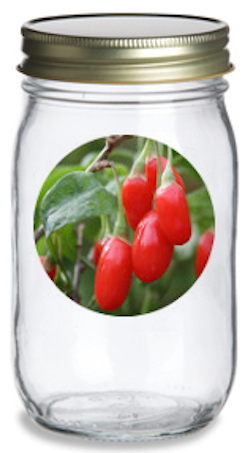 Goji Berries enter the Liver, Kidney and Lung channels. Goji's primary traditional functions are to tonify Liver and Kidney yin and brighten the eyes. They also moisten Lung yin. Read more about Goji Berries. The only ingredients we put in our Raw Goji Honey are Raw Organic Honey, Wildcrafted Goji Berries and Love. Since honey has its own natural preservatives nothing else is needed to keep it in its natural state.